When starting the engine by holding the transmitter over the push button start due to a dead key battery or a malfunctioning key, be careful not to allow the following, otherwise the signal from the key will not be received correctly and the engine may not start. Spare keys or keys for other vehicles equipped with an immobilizer system touch or come near the key. Devices for electronic purchases, or security passage touch or come near the key. Depress the brake pedal fi rmly. (Manual transaxle) Continue to depress the clutch pedal fi rmly until the engine has completely started. Verify that the push button start indication light (green) fl ashes. The push button start indicator light (green) will fl ash even if the push button start is pressed before depressing the brake pedal (automatic transaxle) or the clutch pedal (manual transaxle). If the clutch pedal is depressed (manual transaxle) or the brake pedal is depressed (automatic transaxle) under this condition, the engine can be started by resuming the procedure following this. Touch the push button start using the backside of the key (as shown) while the push button start indicator light (green) fl ashes. When touching the push button start using the backside of the key as shown in the illustration, touch the push button start with the lock switch side of the key facing up. Verify that the push button start indicator light (green) turns on. Press the push button start to start the engine. The engine cannot be started unless the clutch pedal is fully depressed (manual transaxle) or the brake pedal is fully depressed (automatic transaxle). If there is a malfunction with the push button start function, the push button start indicator light (amber) fl ashes. In this case, the engine may start, however, have the vehicle checked at an expert repairer, we recommend an Authorised Mazda Repairer as soon as possible. If the push button start indicator light (green) does not illuminate, perform the operation from the beginning again. If it does not illuminate, have the vehicle checked at an expert repairer, we recommend an Authorised Mazda Repairer. To switch the ignition position without starting the engine, perform the following operations after the push button start indicator light (green) turns on. Release the clutch pedal (manual transaxle) or brake pedal (automatic transaxle). Press the push button start to switch the ignition position. 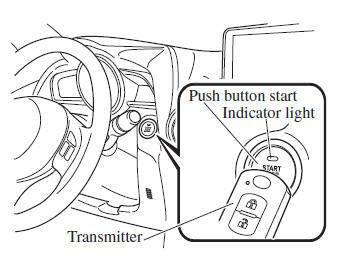 The ignition switches in the order of ACC, ON, and off each time the push button start is pressed. To switch the ignition position again, perform the operation from the beginning.